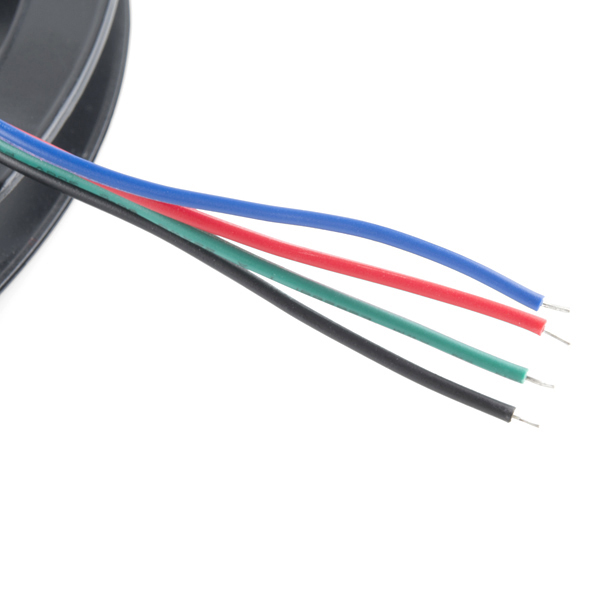 You just need to apply +12V to the + pin and ground any of the colored wires to turn the LED color on. If you want use it with a microcontroller, you would need an n-channel mosfet [ https://www.sparkfun.com/products/10213 ] to turn it on and off. The LED strips require a lot of power (especially the 5M strips) but it worked good with my variable power supply set s 12V/1A. The LED strip does get warm to the touch when using. 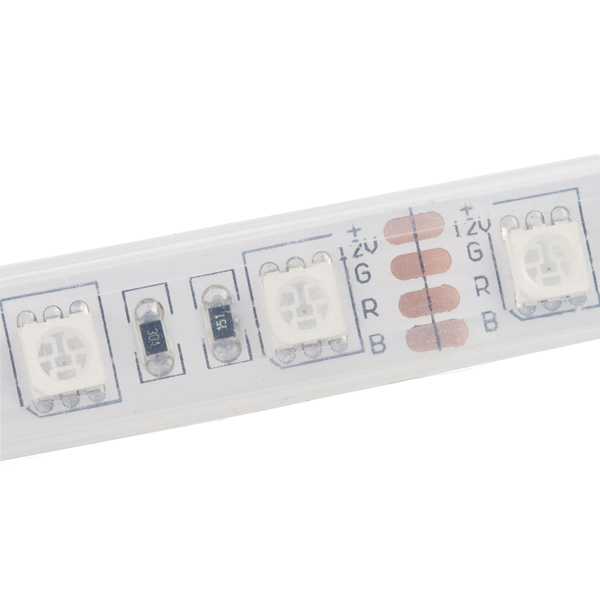 A maximum of two colors can turn on with our 12V/600mA wall wart [ https://www.sparkfun.com/products/9442 ]. It will get hot and shut off. It will work after the wall wart is unplugged and letting it cool down. You might want to just get the 12V/5V (2A) laptop brick power supply [ https://www.sparkfun.com/products/11296 ] or any of the Mean Well Switching Power Supplies in our storefront. These can work also with a 9V battery . A maximum of 2 LEDs with a certain length can be turned on. The internal resistance will go up as you pull more power and they will become dim. You might be able to get it working with all 3 colors if you PWM the strip so that all the colors are not fully turrned on. If you are looking at the details, the LED is flipped and IC is the 5060 package. 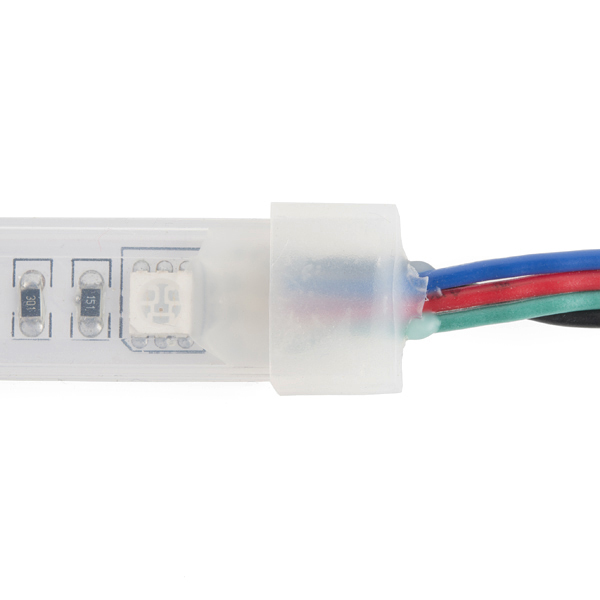 Apply +12V to the + pin and ground any of the colored wires to turn the LED color on. When using with a microcontroller, you would need an n-channel mosfet https://www.sparkfun.com/products/10213 to turn it on and off. The LED strips require a lot of power (especially the 5M strips) but worked well with a variable power supply set at 12V/1A. The LED strip does get warm to the touch when using. I don't understand the wiring for this. Why is there wires on both sides of the strip? I have tried just plugging into the +/GND pins in my breadboard, however it doesn't work... Does anyone have a wiring picture? Or an example code? 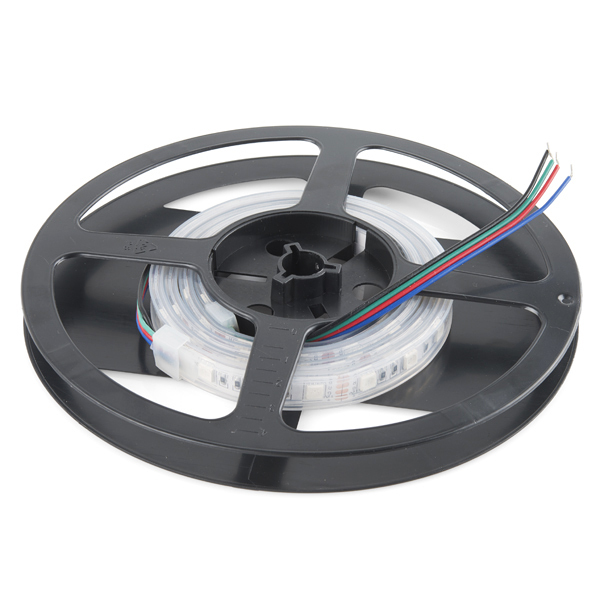 How much current this 1m Strip needs? I'm assuming that these are powered at 5V? These are 12 volt strips. IP65 is the rating. The first number (6) refers to the solid particle protection, which is dust tight, meaning no solid particles can get in. the second number (5) refers to the liquid ingress protection. Level 5 is "Water projected by a nozzle (6.3 mm) against enclosure from any direction shall have no harmful effects." Technically, full immsersion up to 1M of water is level 7. So, the rating kinda looks like it wouldn't work, but your mileage may vary. I would probably look for an IP67 or IP68 rated strip just to be on the safe side. Is there is a bored on sparkfun to control this led straps wireless ?? Is it possible to cut these to length? Thanks. Yep! You just may need to add wires to any ends you cut and make sure you don't end up shorting any lines together.